Ingenious uses the Technology Scouting process to research and evaluate specific technology landscapes by sifting through global data on technology and market environments. This sample report demonstrates technology scouting in the clean energy market space for identifying and exploring upcoming clean energy alternatives. Eyeing the rising environmental concerns, using alternative sources of energy optimally has become significant. The abundant availability of solar energy is making it an ideal long-term source of clean energy that can be used as a viable alternative to currently prevalent non-renewable sources such as coal, gas, and oil. The Global Renewable Energy Market was valued at $ 1,405,640 million in 2016, and is projected to reach at $2,152,897 million by 2025, growing at a CAGR of 4.9% from 2017 to 2025. Rising penetration of renewable energy sources owing to environmental benefits coupled with increasing electricity demand is expected to propel market growth. Technological advancements related to reducing manufacturing cost and to improve performance efficiency is expected to propel demand. Furthermore, rising demand for a clean, reliable and environment-friendly energy source to reduce dependency on fossil fuels is expected to drive growth over the next seven years. 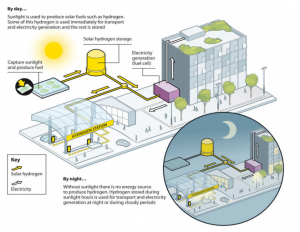 The most eminent and lucrative clean energy technology being solar fuel cells, it’s a technology to capture energy from the sun and store it in chemical bonds, in hydrogen, methane or methanol. These molecules are called solar fuels, which can not only be used for transport and electricity generation, but also as feedstock in (the chemical) industry. 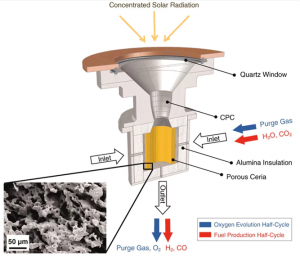 There are two ways that solar fuels could be used to provide sustainable fuels for transport. 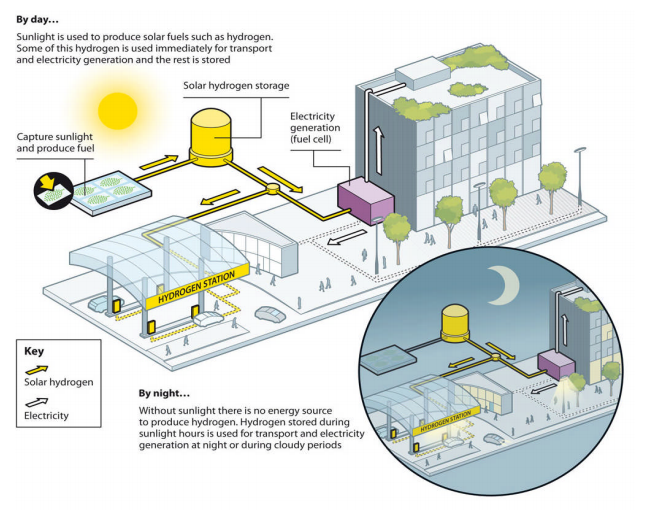 The first is using hydrogen to power hydrogen vehicles. 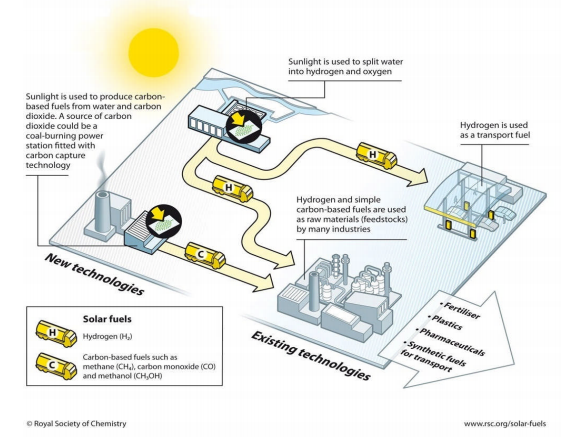 The second is using a combination of hydrogen and carbon monoxide (often referred to as synthesis gas, or syngas) to make liquid fuels for transport (synthetic fuels). This conversion of hydrogen and carbon monoxide into synthetic fuels is called the Fischer-Tropsch process. Currently, synthetic liquid fuels are produced from coal and natural gas by a growing Fischer-Tropsch industry. If the production of solar fuels is achieved on a large scale, it would not only transform our sustainable energy options by providing alternatives to fossil fuels for transport, industry and electricity generation, it could also transform the energy infrastructure. Several projects related to the production of fuels from solar energy have been started in Europe such as SOLHYDROMICS, SOLAR-H2 NANOPEC, and H2OSPLIT. European Science Foundation has recently launched the EuroSolarFuels Eurocores program which aims for solar-to-fuel conversion funded by National Science Organizations across the member states. Solar reactor is a device that directly converts the sun’s rays into fuels that can be stored, allowing the energy to be used at night or transported to locations where it is needed. The solar reactor uses a quartz window and cavity to focus sunlight into a cylinder lined with cerium oxide. Cerium oxide, also known as ceria, is hygroscopic (meaning that it attracts and holds water molecules from the surrounding environment) and will also absorb a small amount of carbon dioxide. 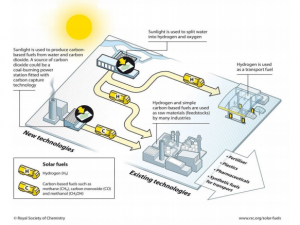 As the sunlight heats the ceria, it thermochemically breaks down the water and carbon dioxide pumped into the cylinder to produce carbon monoxide and hydrogen that can be converted to a liquid fuel. Cerium-based solar reactor prototype is developed by California Institute of Technology and the Swiss Federal Institute of Technology. At present, the market is driven by an increase in demand for energy across the world and decline in a non-renewable source of energy such as petroleum, coal, and natural gas. In addition, it is fuelled by the increase in awareness about environmental safety and security. So, investments in these technologies appear to be propitious. To meet increasing energy needs, while limiting greenhouse gas emissions over the coming decades, power capacity on a large scale will need to be provided from renewable sources, with solar expected to play a central role. While the focus to date has been on electricity generation via photovoltaic (PV) cells, electricity production currently accounts for only about one-third of total primary energy consumption. As a consequence, the solar-to-fuel conversion will need to play an increasingly important role and, thereby, satisfy the need to replace high energy density fossil fuels with cleaner alternatives that remain easy to transport and store. Ingenious identified solar fuel & solar reactor as the upcoming technologies for the clean energy market space that is anticipated to witness pronounced success once employed.